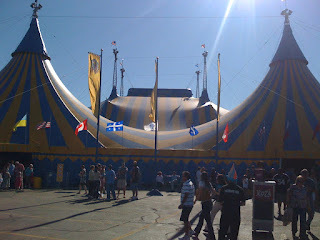 The Beantown Bloggery: Review: Cirque du Soleil's Kooza Is Awesome! Cirque du Soleil's newest traveling show just opened in Boston last week. I've watched pretty much every Cirque show that's come to Boston in the last eight years - needless to say I'm a big fan. The past couple of shows I saw though, Corteo (in Boston) and Zumanity (in Vegas) were not so good. I was disappointed. But when Kooza tickets went on sale, I was psyched and sat on the website the day of the sale trying to get the best tickets I could. I ended up with front row seats for this past Sunday's show. 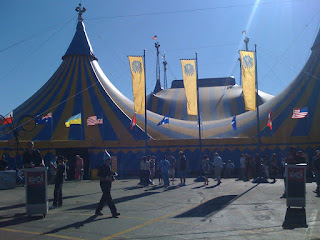 And let me tell you, Kooza renewed my faith in Cirque - the show was wonderful. 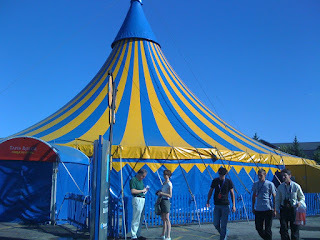 Contortionists, tightrope walkers, acrobats, juggling, something they called the Ring of Death, and so on and so forth. It was captivating. One difference from previous years - the show was at the Bayside Expo Center as opposed to Suffolk Downs. Now I've got my fingers crossed that I'll be able to find some time to see O in Vegas when I'm at CES this upcoming year. I think Quidam is still my favorite, the music and the dark nature of the backstory was so good. But Kooza is definitely a close second. The show will be around through mid-October, I highly recommend it. 2 Response to "Review: Cirque du Soleil's Kooza Is Awesome!" I am also a big fan of cirque. I've seen La Nouba, O, Love, and Quidam. I agree that Quidam was amazing. 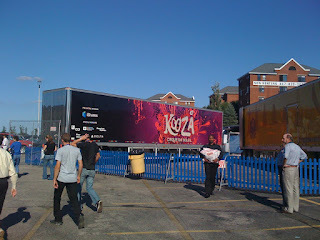 Sadly I will not be able to make it to Kooza. But if you do make a trip out to Vegas again skip O and hit up Love. I saw both back to back nights. Love was first and completely overshadowed O and made it look like a high school play. The show is truly a marvel. If you do choose to change your mind, skip the front section. Get the second section, it is cheaper and I guarantee that there isn't a bad seat in that house, it is a feat of engineering to make everyone's viewpoint perfect. Good review, would love to catch this. I've just read here that Quidam is coming to my home city next year so have been reading more. I can't wait!!!! !